First, I would like to address a few things that have been asked about the first part. Yes, I am using a continuous wire, from a spool, instead of working with a couple of feet of wire at a time. Since I am not drawing the entire length of wire through each loop (instead, the needle allows me to draw just enough to make each stitch), I can work on the spool and not worry about joining new wires, work hardening and other annoying things. Since I generally get a decently sized spool of wire, I am not very precise with how much wire I will need beforehand. I generally estimate around 10 grams of silver for a chain, give or take according to diameter or length. I admit I don't usually bother to convert this to meters, since I buy wire by the gram. And thin wire is just about the only metal I don't prepare myself. It is just too time consuming! Ok, last time, when we left off, we had completed a simple woven chain. Now, let's start mixing things up. Double weave is when each stitch goes through not only the stitch in the previous row but also through the one previous to that as well, so your needle goes through two loops instead of one. The result is a thicker, heavier chain, instead of an airier, lighter result. It wears very well. Making double weave is slower than single weave, since part of the stitch will be hidden by the next row. And since each loop will accommodate two stitches, it is helpful to make the loops a little longer than usual. Or not, for a very fine, very closed chain that will kill your fingers to make but look amazing. 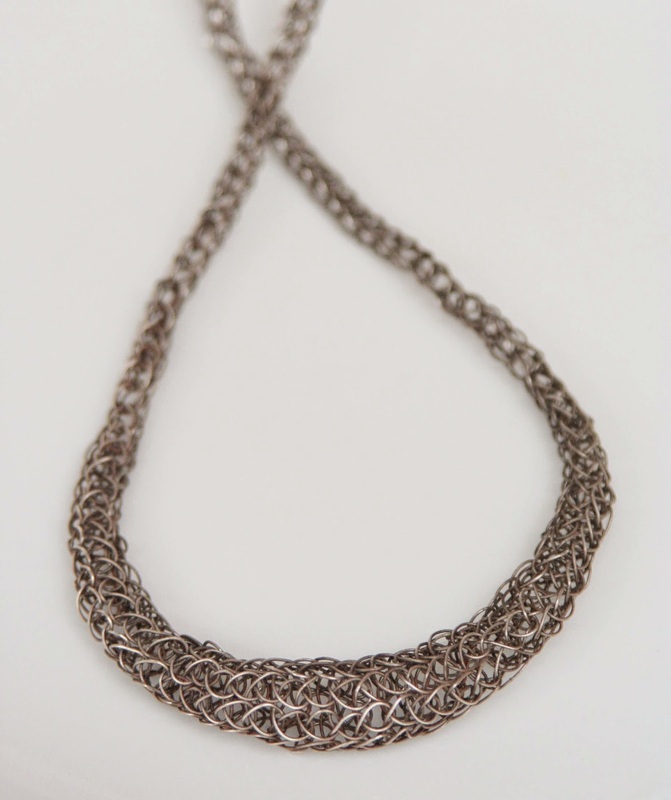 the polished chain was made with larger loops. Sorry, no photos here since I rarely bother with triple weave. It is very similar to double weave, except that you will pull each stitch through the previous three row (instead of double weave's two). The result is an even heavier and stiffer chain - I find it too stiff for my taste, since I love drapey weaves. You will need to make each loop very long, so that there will still be some open space after 3 rows. If you are curious, go ahead and experiment. It is not hard to figure out but it is hard on your fingers. This is a fun variation and you can do a lot with it once you master the basics: you can trap beads in the thicker section (use a thick needle and open weave so it will be visible), you can do several "pods" on a single chain or layer chains with differently placed "pods", you can do wider or tighter graduations, etc. The idea is simple add stitched to increase the diameter of the chain then decrease the number of stitches to reduce it back to the original diameter. Make your stitch as usual. For the next stitch, instead of going to the next stitch on the right, we are going to go back and add another stitch to the previous one. If we try to add the extra stitch to the same on we were working with now, it would just merge into the other stitch. See how the two stitches are sharing the same loop? Now, we are going to skip the next loop (since we already did a stitch there) and move on to the first empty loop to continue the chain. Go on as usual, with an extra loop per row. For the graduated look, you will need several increases over several rows. I generally stagger the increases, so they are evenly spaced instead of lined up, so that it is less perceptible. If you want an abrupt increase in diameter, you can add more than one stitch per row, spacing them out. So, you've gone round and round, increasing regularly, until you reached the diameter you wanted. Time to start decreasing. If you want anything (pearls, beads, found objects) in your pod, add it now. Your next stitch will be the first decrease. Instead of going through one loop, you are going to insert your needle through the next loop and the one next to it. Before making your stitch, take the time to line the two loops up and make sure they are sitting nicely together. Draw your wire, finish your stitch and you have one loop less per round. Easy, peasy. And that is it for today. Chain making is all about practice, keeping stitches even and regular. Considering how "fast" I am pushing these articles out, you will have plenty of time! If you, dear reader, aren't making these, I do hope these articles show you how fantastic this is and how time consuming.